The Chinglish Files by olr: Christmas riddle. This, dear readers, is a highly creative and rather cryptical variant of the standard "Flush after use" (which is what it says in Chinese). Not only did the Beijing restaurant owner take a "W" and turned it upside down. He seemed to have come up with a whole new word. Native speakers, what on earth is meant by "mang out"? Looking forward to your creative postings. "Mang out" sounds like "hang out" to me, like .. "relax ... you've done the job"! Merry Christmas, Here is a gift taken by myself for you. Comment: In cantonese, "冷气机" means "air conditioning". This switch is in my parent's house. 今天看凤凰台的视频，看到关于对你新书的介绍，实在太有意思了。Though I am a English major, I can't make out what the riddle means. Haha, happy silent night. So funny! Where is the pic from? Maybe you can public the source and then owner can show us a explanation. haven't been back to ur blog for quite a while. I used to read every entry before though not leaving much comments. I once saw your book on the shelf in a store that sells all kinds of weird stuff(or creative designs as they may want to put it) in Toronto, Canada. To be specific that store is located in Bayview Village Mall at Bayview/Sheppard. What I really like is the contrast between the euphemistic Chinese bian4 hou4 ("after easing yourself") and the down-to-earth English translation. What I really like is the contrast between the euphemistic bian4 hou4 ("after easing yourself")& the down-to-earth English (which strictly speaking corresponds to da4 bian4 hou4). the whole meaning maybe like"忙完洗手"
Good man,I'm a Chinese i really can't relate this English translation to the Chinese. Mang Out? Perfect! 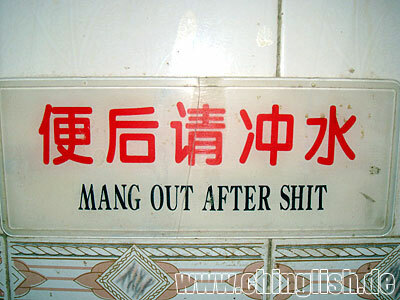 I'd rather take it as a perfect Chinglish expression, "hurry out",haha. After "enjoyed" his toilet "tour" he dashed out in a hurry left the lavatory unflushed. That is the reality. Haha.